Well known banjo maker and Laurie Grundy spends time in the USA often working in conjunction with Paul Hopkins of the DP Hopkins banjo company in his banjo factory near Nashville. Laurie has brought a young man to our attention who, along with his family, is making some serious inroads into the bluegrass music world. Ben Link of The Links, a family band featuring Dad, Mom, five children and two in-laws from Lebanon in Missouri, has been playing one of Laurie Grundy hand crafted banjos for a few years now. Laurie describes the band as absolutely the tightest bluegrass band around. Hailing from the Ozarks they play almost 300 gigs a year spanning from Texas to Canada they are having the time of their lives according to their media statements. They travel on their Silver Eagle bus and share their music in churches, bluegrass festivals, theaters, Silver Dollar City, US Military bases, R.V. parks and misc. events. The Link family consists of parents Becky and Lance and children, Rachel, Kyle, Benjamin (15), Aaron (12), John (11) son-in-law, Landen Keeler and daughter-in-law, Ashley Link. Each member of the family performs. Rachel Link plays mandolin, bas and guitar and sings lead and harmony; Kyle plays all the instruments on stage, mostly fiddle and guitar and sings lead and harmony. Benjamin also plays all the instruments on stage, mostly banjo, sings lead and harmony. Aaron sings lead and plays the fiddle while John sings lead and is learning mandolin. Becky plays rhythm guitar and bass while singing lead and harmony and Lance brings in the foundation sound on the bass fiddle, sings bass as well as being our bus driver and manager. Landen joins the band as sound man and Ashley adds twin fiddling with Kyle. I have never seen any group work the one microphone set up any better than this band. Just check out this YouTube link below and you’ll see what I mean – Laurie Grundy. 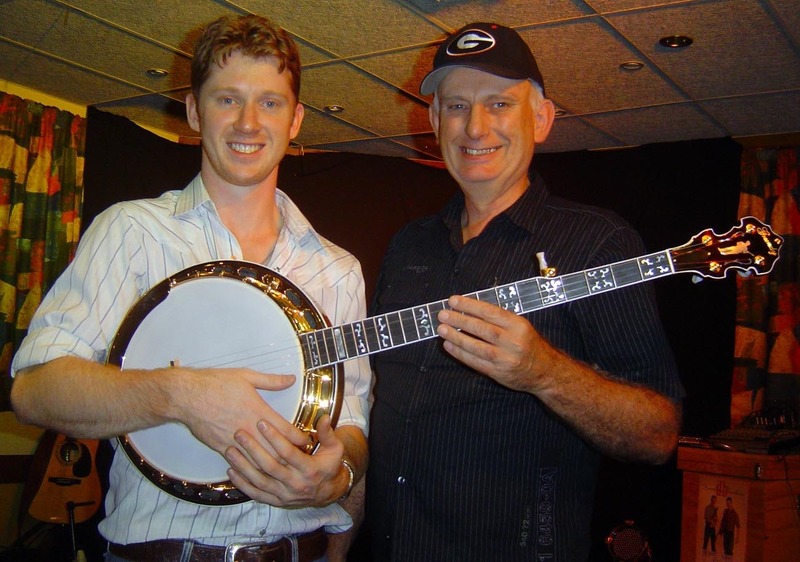 Hamish Davidson of the Davidson Brothers fame, has just taken delivery of a new Grundy Banjo. A Flint River model, serial number 50. Grundy banjos are an Australian made instrument, designed and hand crafted by accomplished luthier, Laurie Grundy from Porepunkah in Victoria. As an avid banjo player, I have had many opportunities to examine the Grundy banjo during its development over the past few years. I believe the the quality of workmanship, level of, and attention to detail and resulting sound is without equal in the country. Australian luthier, Laurie Grundy has spent an inordinate amount of time, researching, testing and crafting timber developing original tone rings and other essential hardware items to create a banjo that can hold its head high against the myriad of offerings from across the world. Grundy banjos are manufactured in Victoria. Their website address is: Grundy banjos.com. Earlier this month we brought you the story of the Banjo workshops in Numeralla organised by Peter Jackson. Of particular note at this workshop was the fact that six of the banjo players at the workshop were all playing that same brand of banjo – Grundy. The banjos were made by the workshop facilitator Laurie Grundy. 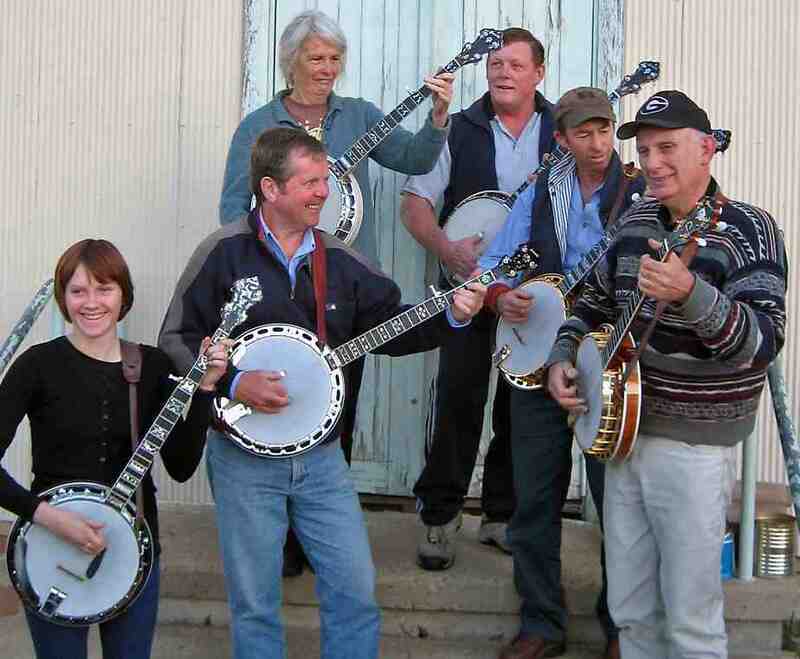 The picture (right) shows the six banjo owners gathered in Numerella NSW. I’ve always believed that the pre-war classic era resonator banjo format is the best configuration for a bluegrass five string banjo and I build my instruments using that system. The main difference in my banjos is that I use the same 1934 formula alloy in all three major hardware items, (tone ring, flange and tension hoop), whereas pot metal was used in pre-war banjo flanges – Laurie Grundy.